National Hot Dog Day is Thursday, July 23. Now you know. Time to teach that old dog some new tricks. Anthropology professor at the University of Arizona by day (he’s currently in Tanzania researching hunter gatherers), and barbecue addict nights and weekends, Dave introduced me to a cross-cultural food phenomenon taking southern Arizona by storm: the Sonoran hot dog. Said dog comes wrapped and cooked in bacon, jammed onto a soft sweet roll under a deluge of charros (stewed beans), grilled green onions and jalapeños, radishes, and cucumbers. And that’s before you add the mayo and three types of salsa. His fiancee Sarah holds the Sonoran hot dog above. Born in Frankfurt, Germany, the hot dog has become a food of the world, customized by every culture that eats it. Here are some dogs in the global hit parade. Brazilian Turbinado: A “jet propelled” hot dog heaped with mashed potatoes, crunchy shoestring potatoes, bacon bits, mayonnaise, and tomato-onion salsa. Brazil (specifically, Rio de Janeiro) is also the birthplace of the samba dog, a popular late-night snack lavished with hard-cooked eggs and a piquant pepper-onion-olive relish. 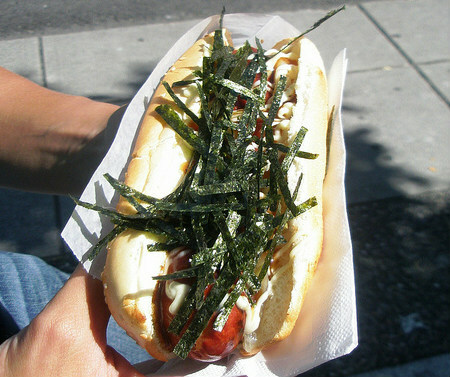 Canadian “Japa Dog”: When in Vancouver, don’t miss the “Japa Dog,” which comes topped with seaweed, teriyaki sauce, Japanese mayonnaise, and fried onions. Photo by Heather Harvey via Creative Commons. Colombian Perros Calientes: This dog comes drenched with salsa, pineapple sauce, mayonnaise, mustard, ketchup, shredded lettuce, and crushed chili-flavored potato chips crowned with a boiled quail egg. Whew! 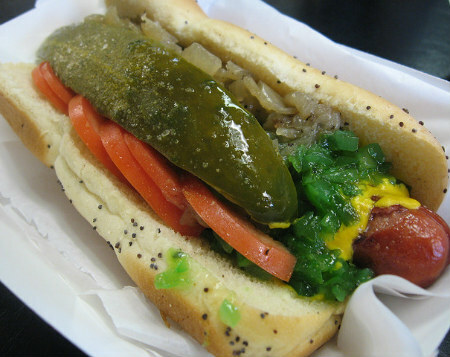 Chicago Dog: This mid-American classic starts with an all-beef hot dog on a soft poppy seed bun. Then it’s topped with tomato wedges, a dill pickle spear, neon-green relish, chopped onions, yellow mustard (never ketchup), pickled sport peppers—kind of like pepperoncini—and a sprinkle of celery salt. Photo by Arnold Gatilao via Creative Commons. Chilean Italiano: Mashed avocados, chopped tomatoes, and a scandalous amount of mayonnaise—colors that mimic the Italian flag—top these dogs. Order a completo, and you’ll get sauerkraut, too. Photo by Vera & Jean-Christophe via Creative Commons. Dutch “Stoner Dog,” a.k.a., “Pizza Dog”: Long famed for its “coffee” shops, Amsterdamers have an ingenious solution when the munchies strike and you can’t decide between hot dogs or pizza. The “stoner dog” features a frankfurter topped with pizza sauce, pepperoni, peppers, and a prodigious amount of cheese. Filipino Hot Dog: Luridly red, these dogs are served with rice, a fried egg, and banana ketchup. But no bun. Guatemalan Shuco Dog, a.k.a. 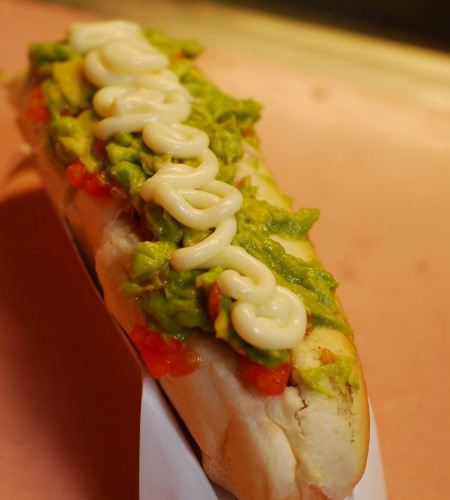 “Dirty Dog”: This dog is served on a hero roll with guacamole or mashed avocado, mayonnaise, boiled cabbage, tomatoes, mustard, and hot sauce. Icelandic Dog: A waterfront hot dog stand in downtown Reykjavik called Bæjarins Beztu Pylsur plies the lunch and late-night crowd with lamb, pork, and beef hot dogs topped with rémoulade sauce (like tartar sauce), a sweet brown mustard called pylsussinep, ketchup, and French-fried onions. New York System Weiners: Part of Rhode Island’s food culture since the early 1900s. To order this veal and pork dog like a local, ask for it “up the arm,” which requires the cook to balance the steamed buns on his forearm as he adds onions, celery salt, mustard, and cumin-scented meat sauce. Swedish Tunnbrödsrulle: Don’t pass judgment on this improbable assemblage until you’ve stumbled out of a Stockholm bar at closing time in need of alcohol-absorbing sustenance. 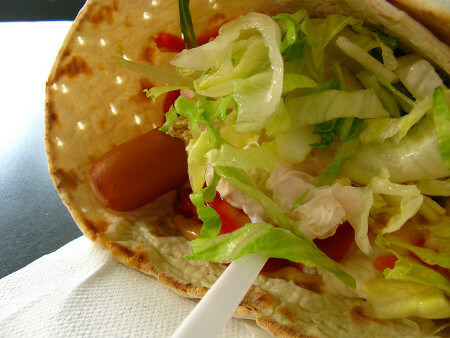 It starts with a soft tortilla-like wrap to which are added hot dogs, mashed potatoes, shrimp salad sloppy with mayonnaise, onions, shredded lettuce, and squiggles of ketchup and mustard. Really. Photo by Steven Coutts via Creative Commons. West Hollywood “Oki Dog”: A Pico Boulevard legend supposedly inspired by a hot dog stand in Okinawa. We’re talking about two hot dogs wrapped in a large flour tortilla, burrito style, with chili and pastrami.